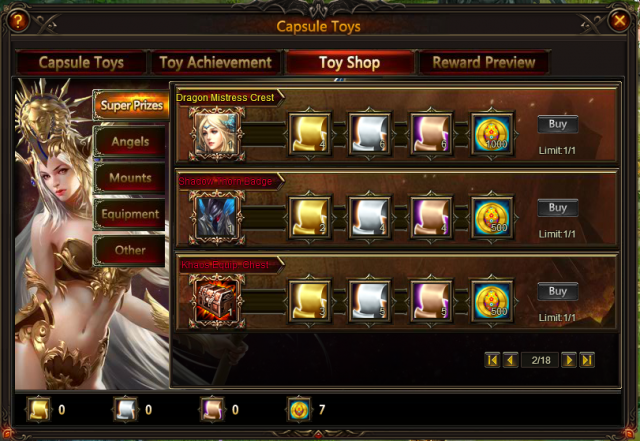 In Toy Shop, you can get wonderful items, Equipment, Angels, Mounts by using Gold Ticket, Silver Ticket, Bronze Ticket, and Capsule Coin. This time you can compete for heroes Dragon Whisperer, Dragon Commander, Dragon Mistress, Blade Dancer, Snow Queen, Fire Queen, Silver Dragon Lord, Shadow Thorn; Angels Raphael, Seraphim, Sunniva, Mikaela, Mikaela Awakening Stone, Vienna, Styx; Mounts Tusky, Scarlet Finch, Armored Elephant, Pride King, Emblazoned King; Golden Attire, Little Red, Steampunk, Frost Wings, Stream Wings ;Khaos Equip. 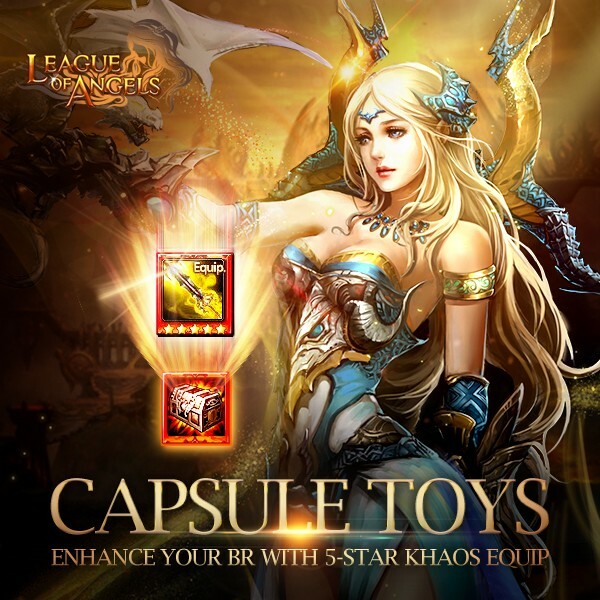 Chest, Rowan, Chaos Compass, Immortal Guardian Totem(Topaz), Divine Emblem, Pandora's Mail and more here! 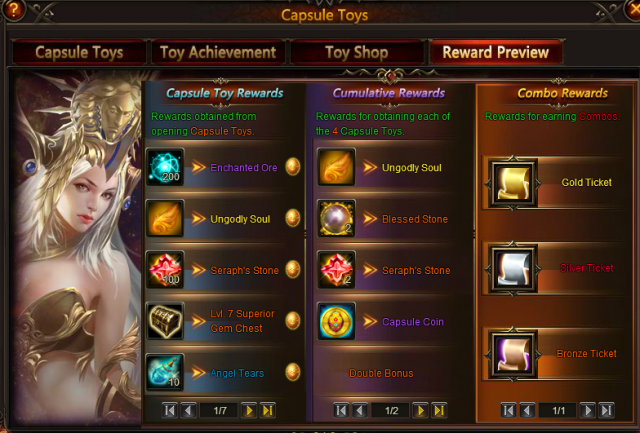 Moreover, many resources are available in Toy Shop this time, such as Khaos Core, Purgatory Soul, Dark soulstone, Energy Vitamin, Lvl. 12 Agility Gem, Lvl. 10 Dodge Gem, Lvl. 10 Agility Gem, Runestone, Synth Scroll, Gem Enhancement Stone, Aegis Shard and more. Don't miss out them! 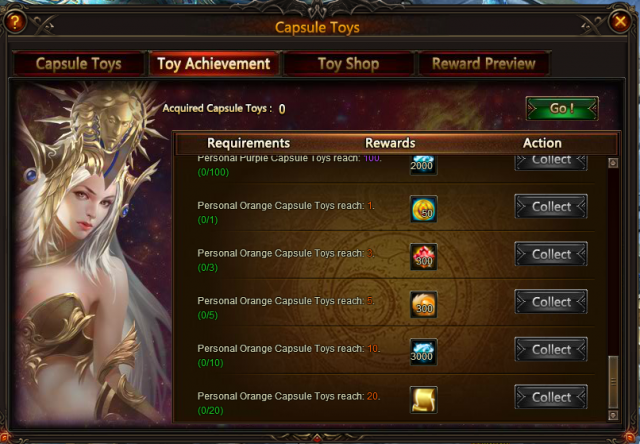 Description: Cumulatively recharge certain amounts during the events to get special rewards! 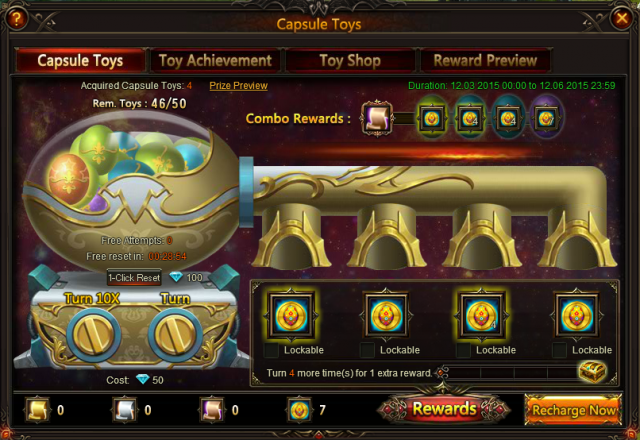 Description: Login each day to win event vouchers!